Color is everywhere this year! Color is Hot! Popular culture has been infused with explosion of color like never before. Fueled by a desire to express a new optimism in the face of an economic downturn, consumers want more color in every aspect of their lives, from fashion, to home decor & architecture, to jewelry & accessories. Are you a woman who expresses her individuality & freedom through color & glamour? Do you have your own personal definition of chic? Is your allure accentuated by the undulating movement of eye-catching jewelry designs? Or are you a woman of sport or business in need of simple pieces to accommodate your competitive fast-paced style? No matter what kind of woman you are, our Fancy Australia Diamonds will complement each of your fashion personalities. From our Fancy Pinks to our Fancy Purples to our Fancy Yellows to our Champagne Diamonds, we've got you covered. As part of our premiere IGYSL Collection, this ring features a beautiful Australian, 100% all natural color Argyle Fancy Purple Diamond center stone. It is a .58ct, oval cut, VS clarity, even color. It comes with a GIA certification. The center stone is surrounded with Fancy to Fancy Intense Yellow Natural Diamonds from the Ellendale Mine out of Australia, round cut (22 QTY), .20ctw. with VS2 clarity. This ring also has lovely crystal clear, top of line white diamonds, finishing out this unique one of a kind beauty. The white diamonds specifications are as follows: Shape: Round (60 QTY), Carat: .28ctw., Clarity: VS, Color: F/G, Cut: Excellent. This stunning ring has 1.06ctw of all natural color & white diamonds. Compare at top design houses for $36K: we source from the same site mine owners. 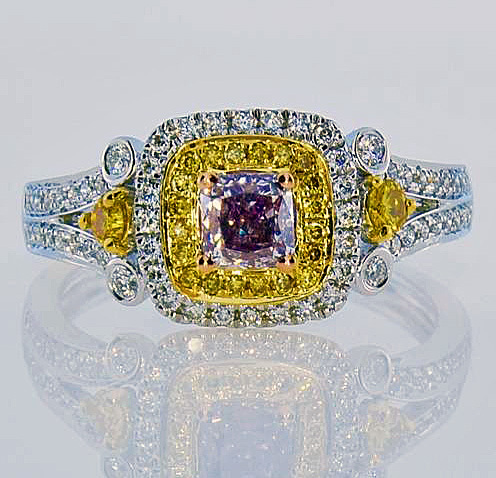 Click the button below to add the Fancy Purple, Yellow and White Diamond Ring to your wish list.